NEW YORK (WABC) -- The New York Jets paid tribute to an NYPD Sergeant who was shot and killed in the Bronx last month. The family of Sgt. 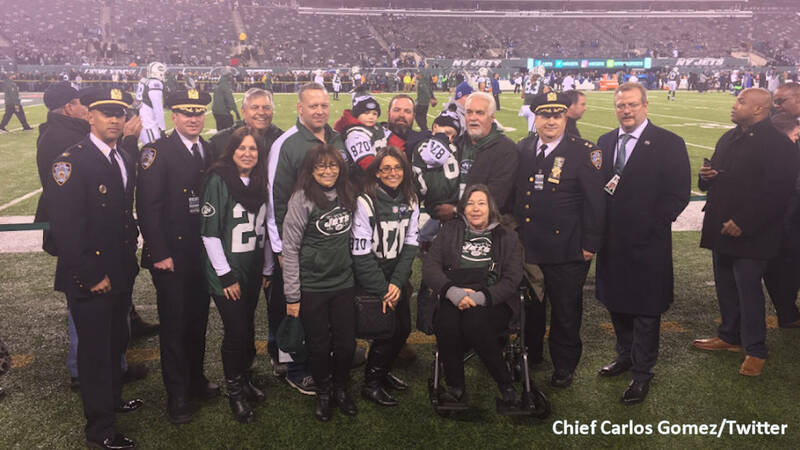 Paul Tuozzolo, a 19-year veteran of the force, along with members of the 43rd Precint attended the coin toss at the Jets-Colts game at Met Life Stadium on Monday night. Tuozzolo was fatally shot in the head in an exchange of gunfire last month with an armed man on a Bronx street. The encounter unfolded after the gunman, Manuel Rosales, broke into his estranged wife's home. Sgt. Tuozzolo was posthumously promoted to "Sergeant Special-Assignment" by NYPD Commissioner James O'Neill at the funeral, prompting a standing ovation. "Sergeant Paul Tuozzolo was everything we could ever wish for in an officer: conscientious, hard-working, selfless, courageous, driven to protect," said O'Neill. "Paul protected all New Yorkers, and he died while keeping people safe." Tuozzolo's wife, Lisa, and their two young sons, Austin and Joseph, attended the game. Tuozzolo, who was 41, would have been eligible to retire next year. He is the fifth NYPD officer to be fatally shot in the line of duty in the last two years. Sgt. Emmanuel Kwo, who suffered a leg wound, is now home from the hospital.